Trouble finding the perfect gift? The gift of beauty is always appropriate and welcome from the discerning woman (or man!). 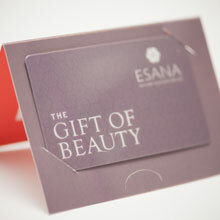 Whether it is a relaxing and beneficial facial to a full assortment of treatments, an ESANA gift card allows freedom of choice to make the gift recipient feel truly special. Available in any denomination in person, over the phone, or instantly online for printing at home.